WordPress offers a wonderful admin panel for start building your site. Most of the time you will be focusing too much on the content and SEO. But minor improvements in daily admin panel usage will drastically improve your overall productivity. We have been using WordPress for more than 3 years and never been checking each and every option on the admin panel. We only access the routine menus like a robot and complete the publishing task. Only time we look into the menu bar is to find the menu item when we installed new plugin. We believe this is the case with most of the WordPress users. In this article we explore 5 admin panel settings every WordPress beginners should know. It is a common habit to search in Google when you need help. But the point is you can simply get the required help inside your admin panel without any plugin. On every screen, look for the “Help” menu just below the top right corner. Below picture shows getting help on the “Tools” menu. Click on the “Help” dropdown. You will see the detailed explanation of the available options on that page. For “Tools” menu, you can see the details for the tools “Press This” and “Categories and Tags Converter”. Links to WordPress codex and support forum are also available as more information. You can get help on each single page on the admin panel. We never know there is a categories to tags and vice versa converter available within WordPress import section until we read this help. We bet you will also find lots of treasure by reading this hidden help menu. Similar to help menu, “Screen Options” menu is another hidden treasure. You can find the screen options menu next to help menu just below the top right corner. This menu will be available only on the applicable screens and not on all. For example, you will not find screen options on “Tools” or “Settings” menu pages. 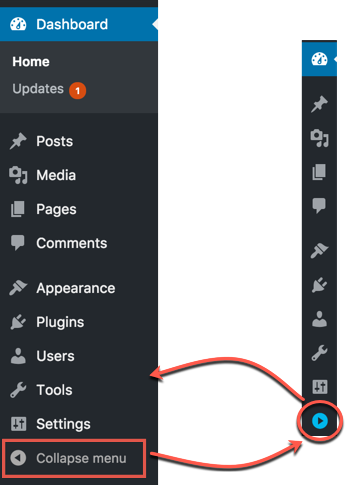 It can be seen on the important screens like WordPress visual editor, which you can see when editing the posts and pages. On visual editor screen, you can do the followings with “Screen Options” menu. Choose the meta boxes to be displayed on the side and below the post editor. Change the layout to single column from the default two columns. Enable or disable full height editor with distraction free functionality. If you ever wonder where the distraction free button on the editor is gone, just enable it under “Screen Options” to bring it back. People use the dashboard as it is after installation. But you can customize to view only important things on the dashboard. Use “Screen Options” to enable or disable widgets on the dashboard. Click on the “Dismiss” link to remove the “Welcome” widget from the dashboard. Basically this will disable the “Welcome” option under “Screen Options”. Drag and drop the widgets on the dashboard to make important widgets are visible on the top. There are many ways to work on the admin panel without distraction. Distraction free writing on the visual editor is one well-known option. But collapsing the big menu sidebar is less known to many of us. Click on the “Collapse Menu” option available as the last menu on the admin panel sidebar. Toggle between expanding and collapsing the sidebar menu to have more space and distraction free working. The last trick is to change the language of your site from admin panel. Generally most of us will provide the default language as “English (United States)” during WordPress installation. You can easily change it under “Settings > General Settings > Site Language”. This will change all menus and options in the chosen language. Below is an example how WordPress admin panel will look like when we choose the language as Hindi. You can create the URLs with Hindi characters instead of English. Be aware that changing the language not only changes the language of the admin panel, it will also change the site language. Search engines will understand that your site is primarily meant for the chosen language and prioritize the search results on geographical searches. You can see the chosen language is declared in the meta tag by viewing the page source.